CORPUS CHRISTI, TX – Sinking or abandoning a vessel is illegal and can harm the coastal environment. 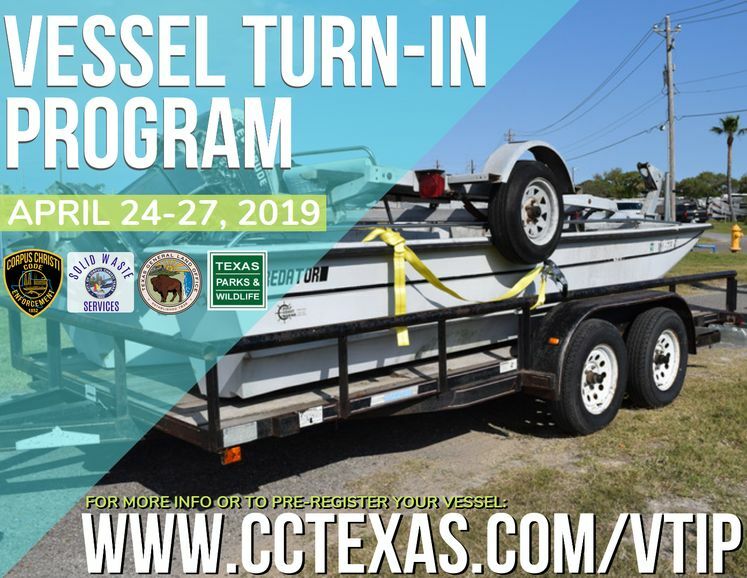 Next week, representatives from Code Enforcement and Solid Waste Services will partner with the Texas General Land Office and Texas Parks and Wildlife to kick off the 2019 Vessel Turn-In Program! The public is encouraged to take advantage of the free event that safely and legally disposes of unwanted or inoperable boats. The program begins Wednesday, April 24th and continues until Saturday, April 27th from 9:00 a.m. to 4:00 p.m. at the Laguna Madre Wastewater Treatment Plant, 201 Jester Street in Flour Bluff. Vessels can be pre-registered for drop-off at www.cctexas.com/vtip (pre-registration is not required, but it will save time). Proof of ownership (title and registration) is required for each boat, wave runner, jet ski, or boat trailer you turn in. All gas, oil, and batteries must be removed from each vessel prior to drop-off. All vessels must be clear of waste and debris. Vessels up to 26 feet in length will be accepted (vessels larger than 26 feet will be accepted on a case-by-case basis). In 2018, the program successfully collected more than 40 boats and 14 trailers. For more information, contact Program Outreach Coordinator Celina Pulcher at 361-826-1655 or by email at Celina@cctexas.com.